When you go into a tarot card reading, you should have some plan in mind so that you will get the best out of the reading. By having some plans, you will avoid wasting your time and money. Also, you will understand the readings to you better. It is important then that you have to prepare yourself at least a day before the psychic reading session. You have to prepare yourself for the possible outcomes of the reading. No matter what the result is, you have to accept it. You have to keep your mind and body relaxed and calm as well so that you will not feel nervous during the psychic reading session. Here are the basic plans that you have to do so that your reading session will be organized and smooth. First one, you should prepare your questions beforehand. The night before the tarot card reading, you should be thinking of what questions should you ask already. In your preparation, do not be too forward. Do not be too timid as well. In other words, your questions should be moderately filtered, not too forward and not too timid. That way, the tarot card reader will be able to answer it easily and clearly. Write down only the important questions. As much as possible, limit your queries up to five. That way, you will not be stressing the psychic reader too much. You have to understand that their ability has limits as well. They cannot answer all your questions, and they cannot always give you clear answers. Second, remove all the doubts that are on your mind. You need to have an open mind so that you will be able to relate and understand the psychic reader. The most important thing is, never doubt the ability of the tarot card reader. Your tarot card reading session will be useless if you doubt the ability of the psychic reader to answer your questions. Never question also the reputation of the reader. It will only make her uncomfortable. If he or she is uncomfortable, he or she will not be able to deliver clear and accurate answers to your questions. You need to have a strong belief that you will get all your questions be answered. So that you will not forget the answers given to you, it is advisable for you to write them down. With that, you have something to review later on. It will also serve as your guide in the future. Finally, be relaxed and calm. 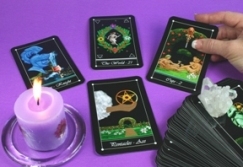 If you are nervous during the tarot card reading session, the performance of the psychic reader will be affected. This is a proven fact. Your connection with the psychic reader will be blurry if you feel nervous. If you feel nervous, the psychic reader can feel your nervousness and that makes him or her uncomfortable. It is important for you then to just relax and enjoy the reading session. Aside from getting your questions be answered, you can actually be entertained as well if you are calmed and relaxed.